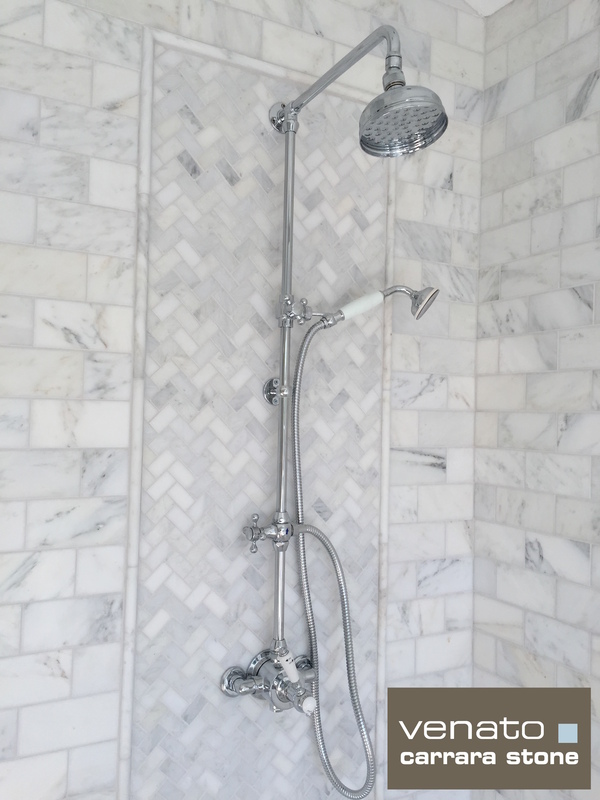 In the shower they chose Carrara Venato 3×6″ Honed for the walls with a 1×2″ Herringbone Picture frame (we have a choice of 24 Herringbone mosaics) around the shower unit using a 1×2″ Herringbone Honed inside that bordered with pencils. A great look, nice and simple so elegant. With the 3×6″ costing just $7.00SF and the Herringbone $11.45SF and Pencil $9.95 Each the Venato collection with over 200 different products has something for everyone. The trick with marble is what you are looking for and making sure before anything ships to you that the image you have in your mind matches what we are sending. As we cannot read your mind – this is where we need to work together! Let us help you. Include us in your plan, your look. We are here to help. If you are 100% OCD and nothing can be wrong “ever” then marble is probably not for you as every single tile has different veining and I would recommend a retailer that can Water Jet cut and pick through tiles to your specification (be prepared to part with $200 a Square Foot). If you are 40% OCD and want a very specific look and people do this. Then over order and pick through or email us. Then we can discuss the costs involved in meeting your standards. Some people are so specific, one customer for example needed 3,000SF of Nero Marquina, it needed white veining with no more than two white veins per tile and no thicker than 2mm. We did it, but it was hugely expensive. As you know, anything can be purchased, you can have any car you want, you just have to pay for it. If you are like the rest of us and know that a Carrara bathroom can add $30,000 in equity to your home and yes, buying direct can save a fortune then you have found the right place. We own the rights to this quarry, it is our product, it is exclusive trademarked brand and even then we do not mark it up like a regular company. We keep the cost low. We work with a no frills marketing strategy (so iPhone images and no marketing budget, word of mouth growth). Operating on the lowest cost possible, (examining if anything can be improved all the time), investing everything into the quality of the product and keeping the price down. We do this to the extreme, an example of this is our Brilliant Glass tile line, we do not even pay with terms (like everyone else), we pay with cash to keep the price as low as possible. Cash is a great way to work it always ensures you are very well looked after. As most businesses always need cash! It also means you are not a debt risk to suppliers, you are therefore provided a better price, quicker shipping and better quality. This is then passed onto our customers. I know….. no debt, it is a strange concept (in a world of debt) but it is one of the ways we make this business work so well. More of how we can do what we do is on our page of FAQ’s. #3 attempts to address the economics in more detail. 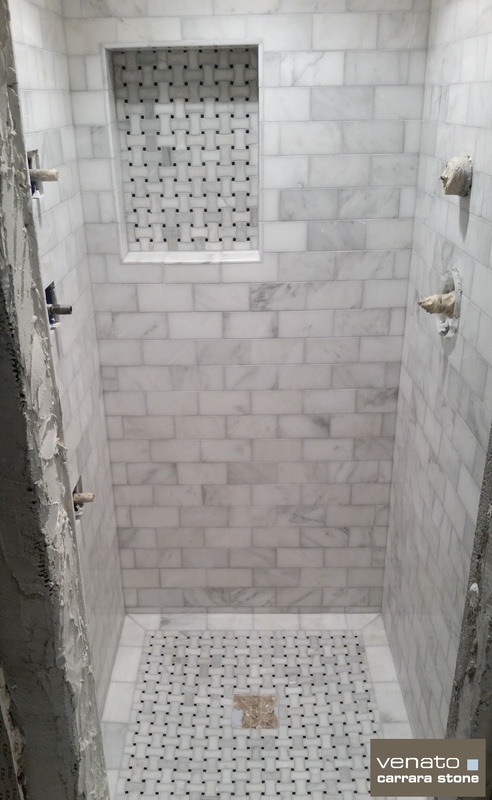 An almost completed Carrara Venato shower. The Dogbone mosaic looks great and the 3×6″ is perfect. What we like about the Venato collection is the number of blank 3×6″ tiles mixed in with the veined tiles. 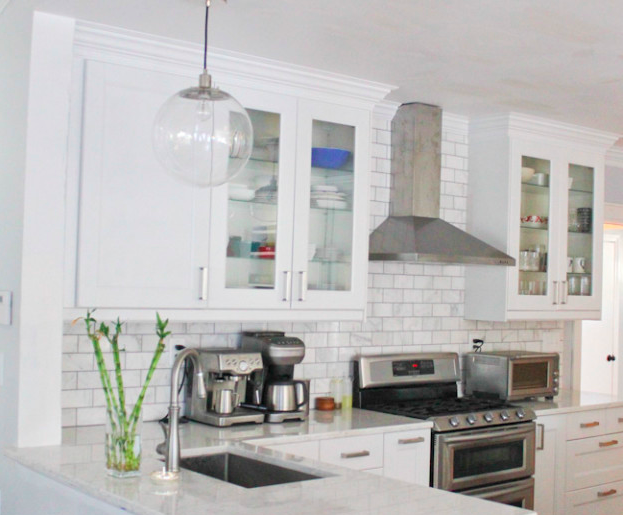 It creates a whiter look, couple that with the almost Calacatta white base and you have an incredible looking marble for a fraction of the cost of a traditional Tile and Stone retailer. We had no control over how she presented the blog or what she had to say about the product. I (David) sent her some photo’s of the lot prior to shipment (we often do that), she said “great, let’s do it”. So we shipped the order freight on a pallet (all pretty much standard stuff). Brittany (the owner of PHG) produced two great video’s and said some really, really nice things. So nice it sounds like we made her say those things (we did not – promise). Personally I love the video’s of showing the installation. Really, really helpful. So Brittany from all our customers a big thank you! (Video’s below). 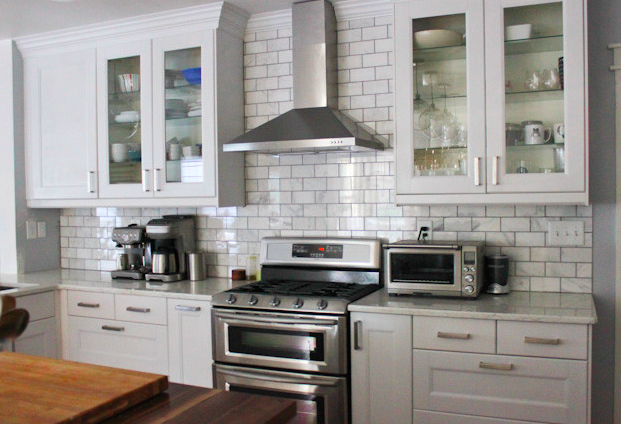 She used the Carrara Venato 3×6″ Honed. It shows you the product, before, during and after installation. Trying not to be biased but the Carrara Venato collection is a knock out. It is just a tremendous product not only for the end user but for us as salespeople. The block selectors overseas are incredible. No where on earth can you get that Calacatta style white base but with nice gray veining. Not overly veined just enough. We actually select it this way. This is no accident, we specify the amount of veined tiles versus non-veined. (I am saying veining way too much). So if you want the best and prices that are just incredible take a look online at our ever increasing range of premium marble field tiles, subway tiles and mosaics. Thank you Pretty Handy Girl.